Jan Vega Rivera(Carla) was hosting a cookout when she first met Corey Shelton. Carla’s cousin was a co-worker of Corey’s and had secretly wanted to set the pair up, but when Corey tagged along to the cookout, there was no need for intervention—it was love at first sight. “I walked in and saw this gorgeous lady cooking, and I knew she was the one,” says Corey of the first time he saw Carla. Nearly two years later, in Atlanta, Georgia, Carla woke up to a surprise proposal and a ring that had been placed on her finger. Just like that, and the couple was engaged. The next year, the two wed at Holy Rosary Church. Following the ceremony, guests celebrated the newly-married couple at The National Museum of Women in the Arts. 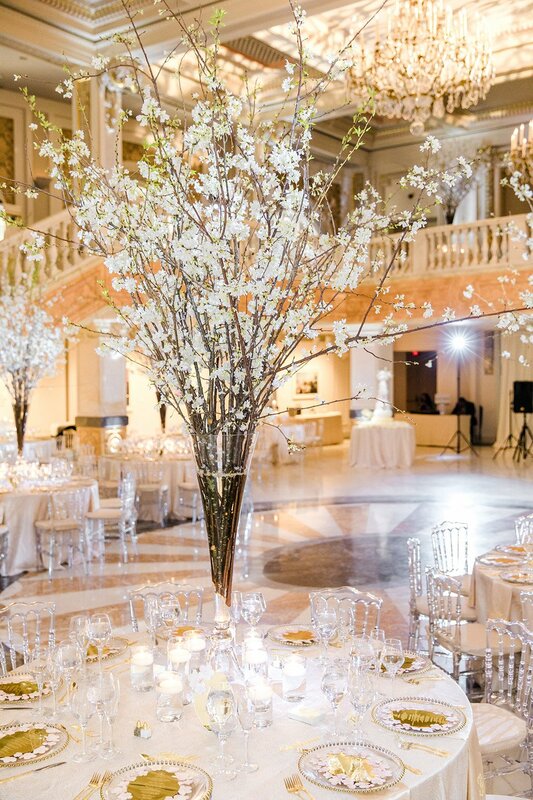 The couple took wedding inspiration from one of the nation’s capital’s most beloved times of the year—cherry blossom season. 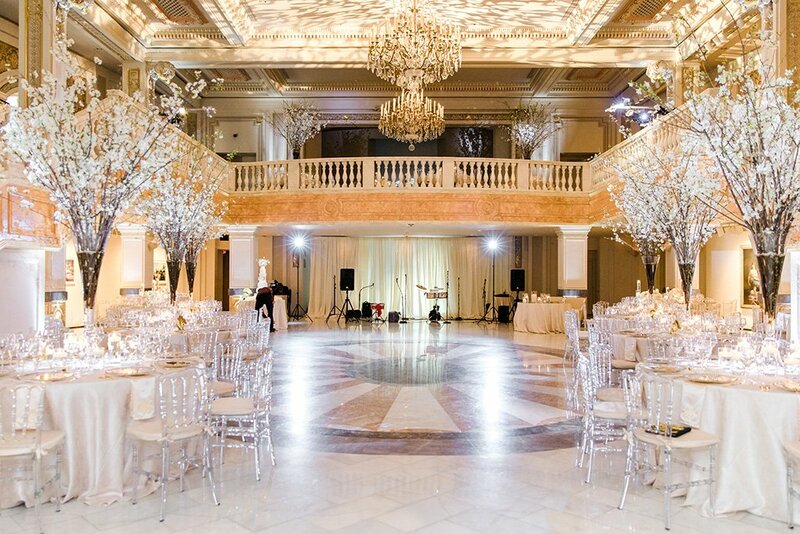 The grand space at their venue, The National Museum of Women in the Arts, was decorated in blush pink, ivory, and gold hues to mimic the blossoms. Giant cherry blossom centerpieces and golden menus with cherry blossom frames carried the couple’s theme throughout the reception area. Carla and Corey had a customized monogram created to use from start to finish. The couple’s invitation suite was delivered to guests in a gold laser-cut box engraved with their monogram that held an acrylic invitation inside a velvet envelope. The monogram detail was later featured on the napkins, bar, and the couple’s wedding cake. In addition to the DJ, a traditional Puerto Rican band paid homage to Carla’s roots. Before the end of the evening, the guests were gifted luxe favor boxes and custom chargers to remember the couple’s special day. After the celebration, Carla and Corey honeymooned throughout Dubai, the Maldives, and France.